Srinagar: Tehreek-e-Hurriyat (TeH) Chairman Muhammad Ashraf Sehrai said said NC’s Omar Abdullah must not forget that what he now calls the barbaric law (PSA) and the reason of human tragedies aimed to brutalize every dissent has actually originated from his home decades back. “Infact supporters of India’s forced control of Kashmir. They are opportunists who work as New Delhi’s daily-wagers in Kashmir. Their only work is to endorse and shield crimes which India and its forces are committing against people of Jammu & Kashmir. He said that the strategies and methods of all these pro-India political parties could be different in different times, but their “ultimate aim and design remains to strengthen India’s military control over Kashmir”. 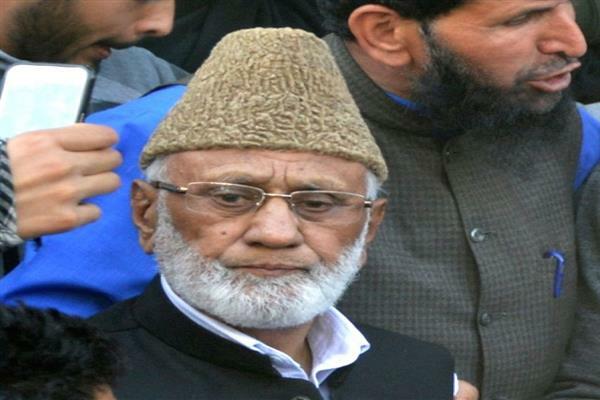 While paying his glorious tributes to the slain Pulwama martyrs, Sehrai said, “The all out war has been launched against the tiny nation with the clear aim of dismantling the rights and to make Kashmiri people to submission. The nation will never budge from its stand and will carry Martyrs Mission till its logical end”. He said the “Sacrifices rendered by youths are exemplary”.